By Kyle Porter, NC Government and Heritage Library, 2018; Jordan Scott, 2018. The U.S. Supreme Court decision in Brown v. Board arrived in two stages. The first phase came in 1954, with the Court decision that segregated schools were unconstitutional. But, the issue of how dismantle systematic school segregation remained. The second stage was U.S. Supreme Court's response in May of 1955, calling for enforcement of desegregation “with all deliberate speed”. What did that mean? Many people who lived through these events, as well as civil rights lawyers, have observed that "deliberate" meant "slow". In fact, after more than ten years following the Brown decision, less than 1% of historically segregated schools had been desegregated. This article will talk about North Carolina's response to Brown v. Board. Responding to the Supreme Court's decision in Brown v. Board of Education on May 17, 1954, Governor William Umstead established a committee to study the issue for North Carolina. By December of that year, the committee determined that desegregation of the state's public schools "cannot be accomplished and should not be attempted". The all-white body of the North Carolina General Assembly voted on a resolution that declared North Carolina’s public education system quality would suffer from school desegregation and integration efforts. Governor Umstead passed away in November of 1954 and was succeeded in office by Governor Luther H. Hodges who also approved the committee’s decision. The committee proposed to give local school boards control over enrollment and school assignment in the state’s public schools. In April of 1955 the General Assembly passed "An Act to Provide for the Enrollment of Pupils in Public Schools". More commonly known as the Pupil Assignment Act, the strategically crafted legislation gave local districts broad authority in making student school assignments. The legislation was seemingly race-neutral, but it allowed local districts to create a number of criteria that black students had to meet in order to obtain school re-assignment. In many cases the criteria were non-sensical. This made it difficult for black students who wanted to transfer to White schools. The law also made it difficult for parents and civil rights attorneys to pursue legal action against the State, forcing them to take action in a piecemeal approach by suing individual school districts. At the time North Carolina had over one hundred and fifty school districts, making it virtually impossible to bring systematic legal action. The Pupil Assignment Act was successful in slowing down legal processes for desegregation. Ten states followed suit, drafting similar measures and legislation in the middle to late 1950s. The Pupil Assignment Act did not go unchallenged. 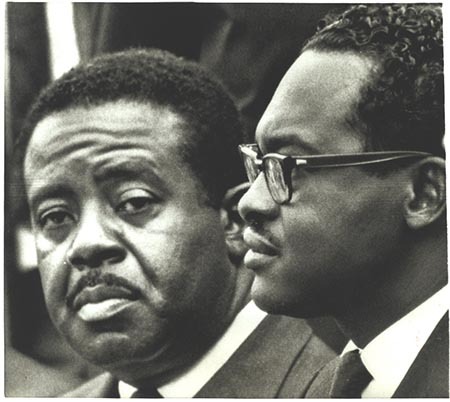 Kelly Alexander, Sr., president of the North Carolina National Association for the Advancement of Colored People (NAACP), spoke out in January of 1955 against the Pupil Assignment Act and planned to counteract discriminatory tactics employed by the State and local governments. Black banker and attorney John H. Wheeler testified before the General Assembly’s Joint Committee on Education in February of 1955, voicing his opposition to the Pupil Assignment Act and its discriminatory effects on African Americans. That same year, the Pupil Assignment Act was amended, but the amendment did not support desegregation. As support for school desegregation began to increase, in 1955 Governor Hodges convened a commission to study the issue. The commission was chaired by Rocky Mount buisnessman Thomas J. Pearsall and included no African Americans. The result was the passage of the Pearsall Plan. The plan gave even more independence to local districts and White families in school assignment and stayed in effect until 1969 when it was declared unconsitutional. 1955, An Act to Provide for the Enrollment of Pupils in Public Schools, Chapter 366 of the General Statutes (passed as Senate Bill 9). Gershenhorn, Jerry. “Defying Brown, Defying Pearsall: African Americans and the Struggle for Public School Integration in North Carolina, 1954-1971.” New Voyages to Carolina: Reinterpreting North Carolina History (2017). 269-289.